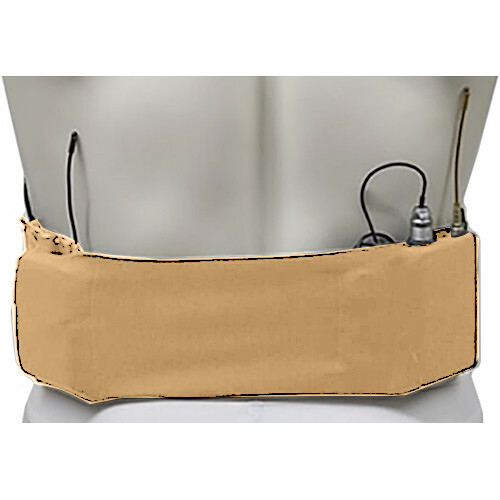 The beige Remote Audio URSA Medium Waist Strap with Double Big Pouch is designed to rig two large wireless transmitters on the talent's waist for stage and screen purposes. Made of comfortable, bonded fabric, the low-profile strap provides stretch, comfort, and breathability with an outer surface that grips hook-and-loop fasteners at any point. The unit also features cable pockets, which conveniently keep the two microphone cables secure without having to tape them. This medium strap fits waist sizes ranging from 29 to 42". Box Dimensions (LxWxH) 5.3 x 4.6 x 1.3"